Powers/Abilities: Skilled fighter. 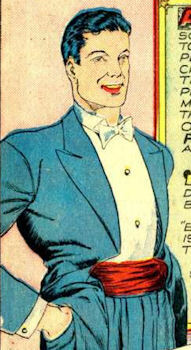 He is a master of the lariat, and skilled acrobat, aerialist and tightrope walker. History: The bored son of a millionaire steel tycoon, Rod Reilly decided to emulate other "mystery men" and become a crimefighter. He had his servant and best friend, Slugger Dunn (a former heavyweight boxing champion) teach him how to fight, then became a crimefighter in New York. Wherever he struck, he left his symbol, the "flaming torch of justice." Comments: Created by S.M.Iger and Reed Crandall. Firebrand's adventures ran from Police Comics #1 to 13. 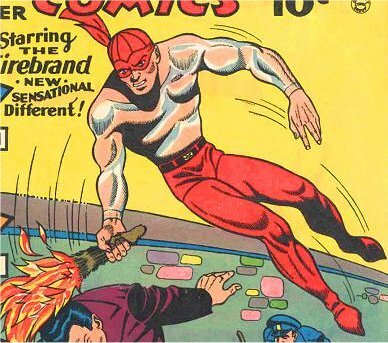 After the Quality line was bought up by D.C. Comics, Firebrand was revived in All-Star Squadron, where Rod was injured during Pearl Harbor, and handed over the Firebrand identity to his sister Danette, who had gained superpowers in the same attack. He would later recover and become one of the Freedom Fighters, before seemingly dying in combat with the Silver Ghost (though he seemed to recover in time for the Crisis on Infinite Earths).